Description The saleyards at Seddon. A black and white photograph from an original taken by McCusker which had been published in the Weekly News in 1909 and now (1959) has been copied by Brayshaw. Written below the photograph on the front is, "The saleyards at Seddon. The centre of the Starborough settlement. 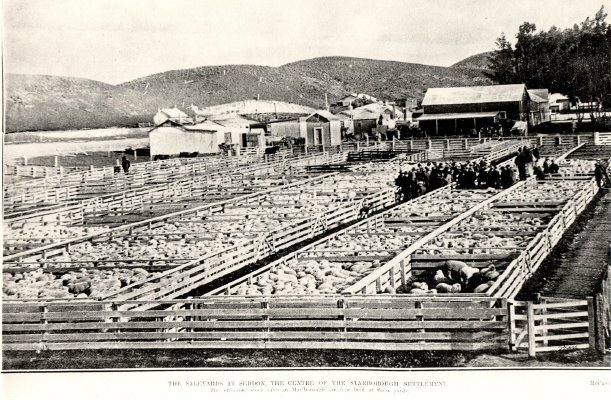 The principal stock sales in Marlborough are now held at these yards." Written on the back of the photograph by Norm Brayshaw is, "Copied 1909 Weekly news Jubilee No. Saleyards at Seddon 1909." Information as typed by Norm Brayshaw: "Seddon. Starborough. The saleyards at Seddon which at that time was the centre of the Starborough settlement. These yards would cater for the most of the transactions between Blenheim and Kaikoura." Copied by Norm Brayshaw in 1959 from the 1909 weekly News, Jubilee number. Includes a negative.